Join the discussion on our forums! Come discuss Gurubashi Chicken over in our dedicated Gurubashi Chicken discussion topic. This card is so god-awfully horrendous that it's good. Meta-defining, absolutely no doubt about it. One time we will see a KFC-Deck; right now we still don't have enough chicken! Not cute enough to take Murloc Tinyfin slot. The meme slot is finally revealed! How does it gonna work as a zombeast with Knuckles ? Angry chicken is a better variant. It is more easy to buff and damage Angry chicken, then buff and do an Overkill with this..
How can you dust an obviously overpowered card? Just wait for the nerfs to come, then maybe.. Obvious trash MEME card alert. 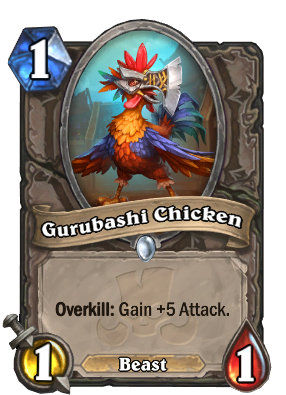 The only thing going for it over angry chicken is it can gain +5 attack with each overkill but thats every hard to achieve even one overkill. 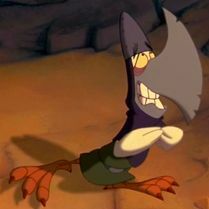 Anyone got the reference from the 'Quest of Camelot' movie? Remember "Overkill" works multiple times. If you can create a high health zombeast with this one it can snowroll into a VERY high attack minion. Go, skilled players! Excavate value from this. Take a challenge! So much power in such little one. Not worth building a deck around, but a card that could snowball if buffed correctly without an answer. I look forward to seeing some priest or paladin make this work in a crazy gimmick, but yeah otherwise this is mostly there for Hunter Beast chaos and being a disappointing random card in brawls and other RNG times. No sht sherlock, it's for Zombeast creations.